GitHub - cri5ti/ai-layers-export: An Illustrator script to export layers to png. An Illustrator script to export layers to png. Want to be notified of new releases in cri5ti/ai-layers-export? This script is based on Jon Hicks original SaveLayersAsPNG script which exports the top layers one by one. When you're working on some big UI designs, you usually have lots of layers and sublayers, things that have to always stay visible, or some more complex scenarios. This script will export layers recursively based on some flags at the end of the layer name. 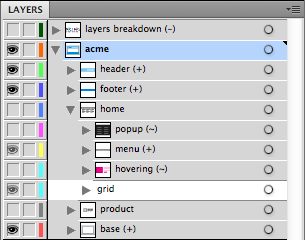 (~) - popup layer - useful for overlays and popups, the script will export once with the layer hidden, and once visible.